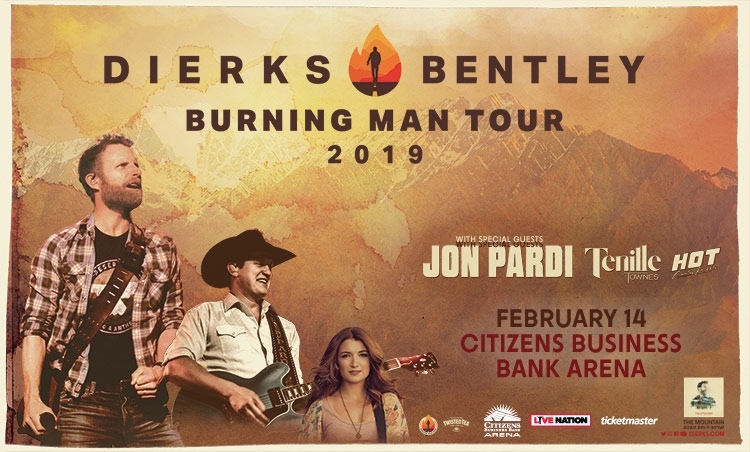 On 2/14/2019, Dierks Bentley with Jon Pardi and Tenille Townes rocked the Citizens Business Bank Arena in Ontario, California for the Burning Man Tour. This smaller sized arena is the perfect venue for a concert like this because no seat is “too far” away from the stage. This was my third time seeing Dierks and fourth time seeing Jon Pardi. Also in tow was leftover 90s country rejects Hot Country Knights to warm the crowd up. This Valentine’s Day night became particularly heated among the boys (who cares what their names are) when they began fighting on stage over who should receive a rose from one another, as if it isn’t bad enough always seeing them fight over which one is the singer or who’s going to sing the next song. Lordy…I don’t know why Dierks Bentley continues to invite them on tour, maybe pity? Later on, Dierks gave them a thumbs down. Next up was Tenille Townes, an up and comer with her a distinctive style. I felt she was channeling a little Janis Joplin with her long hair flips and velvet outfit. Her band’s sound was very rock oriented, layered with Tenille’s raspy voice. She seemed genuinely excited to be on stage, and she joined Dierks to duet “Different For Girls” with him. Jon Pardi, the proud Californian took the stage shortly after Tenille. His band’s stage set up looks similar to the three times I had seen him prior, with a wooden fence design, however, it has had some nice upgrades, including video screens. Jon has a fairly traditional country music sound and look. I wouldn’t be surprised to hear that he is a big Dwight Yoakam fan because Jon moves his hips and holds his guitar just like Dwight. Coincidentally, when I saw Dierks Bentley at the Hollywood Bowl in October 2018, Dwight joined him on stage for a few songs. Dierks Bentley took the stage about 35 minutes after Jon. His show was similar to when I saw him in October, but scaled down a bit. However, the energy was still there as always and the audience ate it up. A small stage was set up at the back of the arena for Dierks to sing a few songs on in the middle of his set, which also included him shotgunning a beer with an audience member. Dierks Bentley has a ton of hits that he knocks out one by one throughout his show, but he also introduced his new single “Living”, which sounded great and will surely be another hit for him. This Valentine’s Day night ended up being the perfect country music date night. Dierks Bentley had yet to disappoint me and I don’t think he has it in him to be anything less than stellar. His singing, moving around and talk between songs comes very natural to him. Audiences connect with an artist like this because it makes them feel special while being entertained.